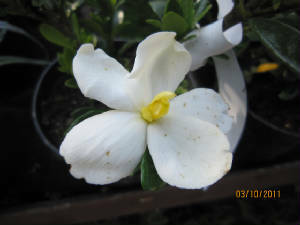 Strong and easy to grow,rounded glossy leaves,bushy habit.White flowers from April repeat through the growing season. Height to 120 cms. Upright shrub producing corymbs of cup-shaped white flowers in profusion in ealy and midsummer. Peeling,pale brown bark when mature. Height to 2 metres. Arching and spreading growth, the long racemes of white flowers are borne early to midsummer. 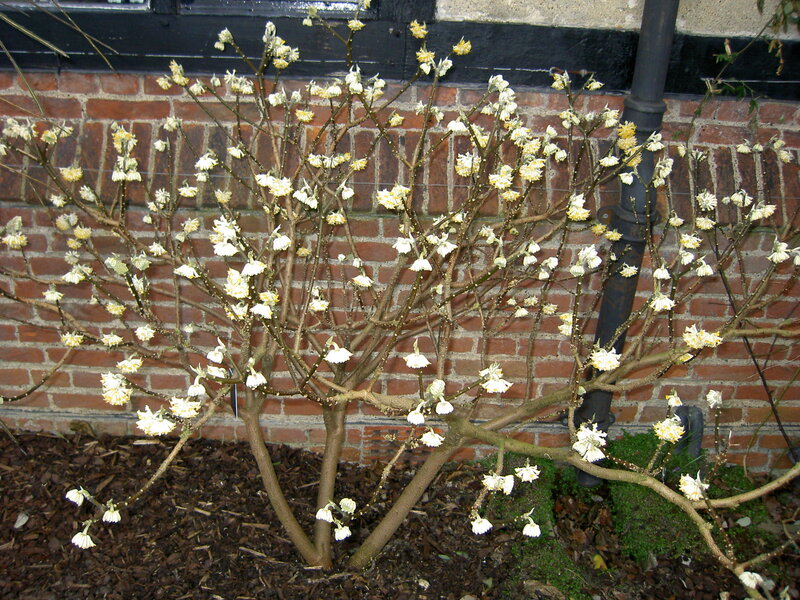 Lovely early flowering shrub having rounded heads of cream/yellow scented flowers from February. Large green oval leaves and a neat,rounded habit to about 1.5 metres. Recently introduced this variety has really silvery leaves making it a superb contrast for other shrubs. Height 2-3 metres. Evergreen tree having glossy,rich green leaves. The open,creamy white flowers are borne profusely in late Summer and Autumn.Upright habit. Evergreen,glossy green foliage and a fairly upright habit. The small,creamy-white flowers are borne in profusion in late Summer and Autumn. Lovely evergreen tree habing glossy ovoid leaves and producing large flowers of pale pink with red stamens in late summer and autumn. Glossy evergreen brightly variegated gold and green foliage.Useful shrub for front of border,ground cover or training as a low wall shrub. Beautiful spring-flowering shrub,the hanging racemes of pure white flowers are produced in abundance from late March to May. Arching growth to 2 metres. 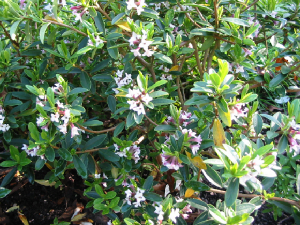 Hardy outdoor form of this popular shrub.Neat,rounded habit,glossy green foliage.Scented white flowers over a long period.Height 60 cms. 'Royal Grevillia'- amongst tha hardiest of the Grevillias this species has lovely silver-grey foliage. The honeysuckle-like red flowers appear from orange buds intermittently through the growing season.